I am concerned for my baby: She has jitteriness at 3 months of age. From the time she was one and a half to 2 months old she started having jittery movements, which are still persisting; and she is 3 months old now. Sometimes these movements happen on her hand and sometimes leg. Moreover, when she is not well the number of times jittery movements come increases. Doctor is it abnormal or is it normal among such small babies? 1. 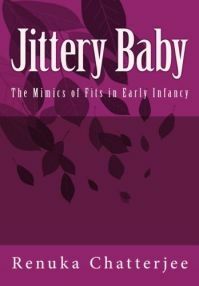 The fact that jitteriness started between 6 to 8 weeks age rather than within a week after birth. 2. Moreover, though normal jitteriness of newborn can very rarely extend into early months of infancy, it usually resolves spontaneously by 2 months of age. 3. Your baby's jitteriness could therefore qualify as abnormal and need to be checked for the causes of abnormal jittery movements in infants. 1. What increases; frequency of jitters in each episode, episodes of jitters or duration of each episode? 2. What is the duration of each episode? 3. Do they predominantly occur when baby asleep or awake and active/ crying and being handled? 4. Can you initiate jitteriness by stimulating the baby or does it comes only on its own? – Any triggering factor that you may have noticed. Twitching that can neither be induced nor stopped by external stimuli need prompt medical evaluation. 5. Are the movements like twitches, jerky or rhythmic & vibratory? 6. Has the character of movements changed since they first started? Do the movements move from one part of the body to other or they start at different parts of the body and continue to be there? 8. Do the jittery movements involve any other part of the body besides hands and legs?- For example; blinking of eyes or any other abnormal eye movements, tongue movements, sucking movements or twitching of face muscles. 9. Have you ever noticed any change in her color or color of her lips during jitteriness? 10. Are the episodes of jitteriness associated with changes in breathing pattern, difficulty in breathing or breath holding spell? 11. When she is not well: What is the sickness that your daughter suffers from? 12. Did these movements start with some episode of sickness or you first noticed when she was about a month 6-8 weeks old? 13. Did she have any problem at the time of birth or immediately after that? 14. Did she have any fall or had any episode of excessive jerking - say a rough ride or while playing with her? 15. Is her growth and development normal for age? 16. Do they stop if you firmly hold the hand/leg that is tremulous? 17. Is your daughter or you on any medications? 18. Are you maintaining monthly measurements of her head circumference? If yes, please post the measurements. 19. Do let me know if she has any abnormal features - anything that you may have noticed and felt concerned about. Your answers will help me answer to your daughter's case more precisely. Generalized causes of jitteriness at 3 months will only add to the confusion. You can post your answer as comments for this page. if she is lying on her back and it's like she attempts to life her legs and they start to tremor for a few seconds. It also occurs when I life her legs up for a nappy change. Her hands also shke too. I first noticed when she was 5 days old and now they are still there at 4 weeks old. She has great eye contact and is feeding very well and its not bothered by them. When she has her tremors I can stop them with my hand. Do you think they will just stop? They just occur so frequently throughout the day I can't imagine them disappearing by 2 months. When I was giving feed for my 7 month old boy during sleeping soon he started shivering all body and head for around 1 minute. He is otherwise fine; no up-rolling of eyes. He slept quitely after that. Next day again while feeding during sleep he started shivering in the head and left hand, for around 30 seconds. He was fine at that time. 1. Aspiration when fed during sleep. Aspiration causes choking, but you have not mentioned any signs like coughing or breathing difficulty that are usually associated with aspiration; however small the aspiration may be. More common in male infants. Often occurs during light sleep. 1. Contact your local doctor immediately. 2. Do not feed a baby when he is sleeping. 3. Do not feed an infant in lying position - neither the baby nor you, the mother. 6. Shivering of Head and All Body While Feeding During Sleep - Please scroll up the page to read.